"Next Sunday, April 15, is the 10th birthday of our first album Fury and the Fallen Ones. We thought the best way to celebrate was for the 5 of us to get together and throw a party, and to invite all of you to be a part of it. 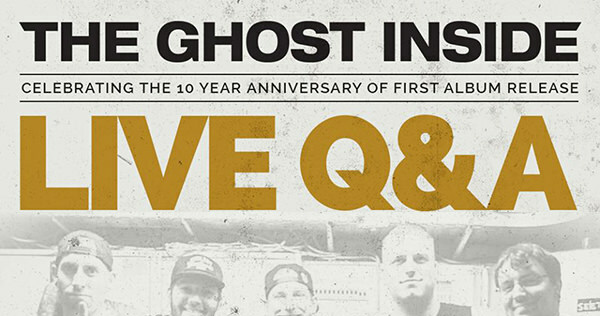 For the first time in 2 1/2 years, we are going to be together not just as guys recovering from our accident, but as The Ghost Inside, streaming on Facebook Live and taking your questions. "We want to celebrate a decade of sharing music with all of you, and take the opportunity to open up about where we've been, where we're at....and where we're going. "So bake a cake, frost it blue and gold, and meet us on Facebook Sunday April 15 at 4 PM EST, 1 PM PST."